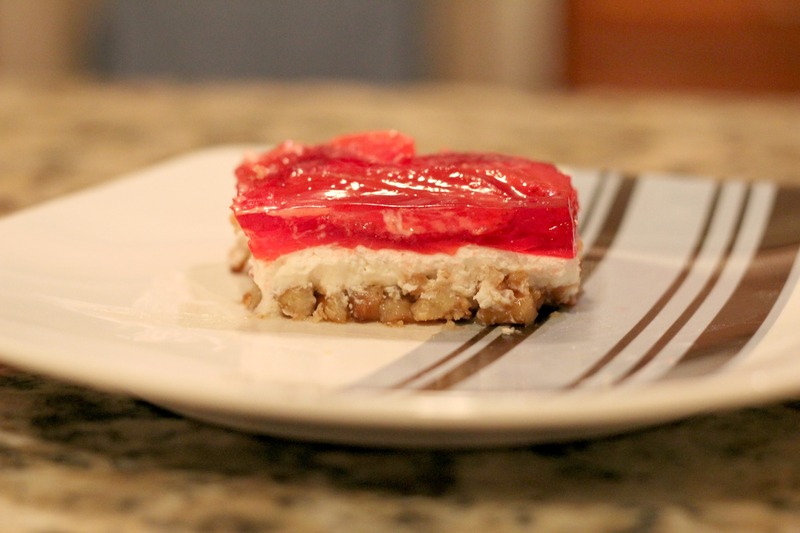 This dish is the perfect treat that’s both sweet and salty and is characterized as both a dessert and a side dish: Strawberry Pretzel Salad. I remember the first time I ever had this. It was at a Christmas pot-luck dinner when I was young (I don’t know how old, but still in elementary school). I was confused because this obviously dessert-looking dish wasn’t sitting with the desserts, but with the side dishes. I asked my mom about its misplacement, and she told me that it’s a side dish because it’s like a SALAD. My world turned upside down. A SALAD?! It was like a free pass to eat dessert before the rest of my meal. I of course loaded it up onto my plate feeling like I had just gotten away with something huge. So now, all these years later, little has changed. Call it a side dish if you want, but it’s certainly sweet enough to be a dessert. If you love the combination of salty and sweet, then you will absolutely love this. Stir together crushed pretzels, melted butter and 3 tablespoons white sugar; mix well and press mixture into bottom of 9x13-inch baking dish. Bake 8-10 minutes, until set; set aside to cool. In a large mixing bowl cream together cream cheese and white sugar. Fold in whipped topping. Spread mixture onto cooled crust. Thank you! I just recently started blogging so it’s nice to have some positive feedback! My mum makes this all the time. Sooooo good! Hardly lasts a day in our house. Tell me about it! My mom made it a lot for special occasions when I was younger, and I loved it so much I had to get the recipe myself. This sounds yummy. However, I would like to point out that fresh strawberries will not prevent the gelatin from setting – I have been using the combination in recipes for years. It is fresh pineapple that contains the enzyme you are referring to. I use fresh strawberries when I make this and have never had a problem My recipe calls for 1/4 of chopped pecans with the pretzels but I am going to try without as your recipe calls for. This recipe is a Family favorite in my home I never thought about putting chopped almonds in the crust, I will have to try this out – Thanks. There is a link to a printer friendly version just below the recipe title and above the ingredient list. Just as an FYI – strawberries are okay You cannot add pineapple, guava, mango, or kiwi to jello because of the enzymes, but strawberries are just fine! You can also use the sugar free jello and/or skip the sugar entirely..it still tastes great! Great idea Melody! As long as it still tastes good, it’s nice to cut out a little of the sugar! I used to make this when I lived in Oklahoma, and we loved it!! We live in the Philippines now and I can’t get fresh OR frozen strawberries. I occasionally find strawberry pie filling (imported and so expensive! )…how do you think this could be used? Think I would need to just rinse the strawberries? Oh goodness, that is a predicament! You might try using the pie filling instead of the jello Just spread the filling on top of the cream cheese mixture and then refrigerate I honestly don’t know how that would turn out, but that’s my best guess! Let me know how it goes! We have had this at every holiday for 40 years. It is the best !!!!! Isn’t it though! We’ve had it many times throughout the years too, and it’s always devoured! This is for Marie: I have a jello recipe that uses blueberry pie filling in one of the layers, and you just mix it in with the jello Just use a little less cold water I’d skip the extra sugar, too, since the pie filling will already be sweet Hope this helps. Hi Ashlee! Let’s see if I can clear it up a bit. First, I’, not sure I understand what you mean about taking away from heat. In this step, you mix the gelatin powder in boiling water, and then add the strawberries. So the liquid will still be hot when you put in the fruit. Then you let it sit for a couple minutes. By the “egg white” consistency, I meant like straight out of the egg, not frothy after whipping them. In other words, it’s still liquid, but it’s thicker than water. You have to catch it in that short window of time between super runny and solidified jello! Hope that helps, and I hope yours turned out ok today! Hmmm I really don’t know! It seems like it would work the same. If you use pineapple fruit instead of strawberries, make sure they’re frozen or the jello won’t set! If you try it, please let us know how it is! Um maybe a couple of hours? Pretty much the same amount of time as regular jello I think. This works well with any flavor gelatin, I remember having it with orange gelatin and also had coconut added to the gelatin besides fruit. Anyone ever try blueberries? I also remember having it with blackberries, that we had picked ourselves. That sounds great Terri! I’ll have to try it with some different flavors! If you really want to add pineapple… my recipe says to add a 20 oz can crushed drained pineapple to the cream cheese mixture. That’s how we’ve enjoyed it for 25 yrs.